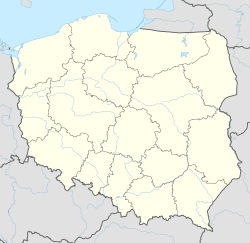 Łapy [ˈwapɨ] is a town in north-eastern Poland, in Białystok County (powiat), Podlaskie Voivodeship; the administrative centre of the urban-rural gmina Łapy. It is situated in the North Podlasie Lowland, on the river Narew. According to data from 31 December 2010, the town had 16,049 inhabitants. Situated here are the bankrupt Railway Fleet Repair Works, a dairy, and the sugar refinery closed in February 2008. Now, Łapy is a medical and educational centre for the region of the former Łapy county. The town of Łapy is located in north-eastern Poland. According to Kondracki's division of Poland into physico-geographical regions, the town of Łapy sits on North-Podlasie Plain, over the Upper Valley of Narew. The town of Łapy lies by the Narew river. The terrain is elevated here from 120 to 130 metres. Included in Białystok agglomeration, the town is situated in the buffer zone of Narew National Park. According to data from 1 January 2010, the town area then was 12.14 km2. Between 1954 and 1975 Łapy was the administrative centre of Łapy County of Białystok Voivodeship. Between 1975 and 1998 the voivodeship was smaller. The name 'Łapy' is of Masovian origin, and it initially represented a soubriquet of the kin, who founded the settlement on Narew. A legend links the foundation of the town with the nobleman Łappa of the Lubicz coat of arms, who settled down here during the 15th-century Masovian colonisation. The first historical records of these lands come from the early 13th century. It is known that in 1375 Płonka Kościelna was an independent parish. Firstly Łapy was a backwater where the gentry cultivated patriotic traditions. Soon as a result of the village's development, new settlements emerged on the eastern and the western banks of the river Narew, which was a water trade route from Suraż to Gdańsk in 16th and 17th centuries, and after the WW II from Puszcza Białowieska to Tykocin; and at the east side of the high road from Suraż to Płonka. Following the expansion of the family, a series of backwaters were founded, including Rechy, Brusięta, Barwiki, Korczaki, Pluśniaki, Wągle, Wity, Zięciuki, Kosmyki, Łazie, Stryjce, Wojtysze. Some of those names disappeared replaced by others, such as: Goździki, Dębowizna, Bociany, Leśniki. After the Third Partition of Poland, Łapy lied in the Prussian Part, and in 1887, after the Tilsit Peace Treaty, it became a part of the Duchy of Warsaw, and later, in 1815, of The Kingdom of Poland. An important event for the future history of Łapy was Napoleonic army's marching through twice in 1812. In the 1820s the backwaters had 1000 inhabitants and 180 houses. In 1825, a fusion of six backwaters (Łapy-Barwiki, Łapy-Leśniki, Łapy-Zięciuki, Łapy-Wity, Łapy-Goździki, Łapy-Bociany) produced the farm settlement of Łapy. Łapy owe its development to the Warsaw – Saint Petersburg Mainline with a station here, opened on 15 December 1862, and to the French having built here the works for repairing steam locomotives and carriages the same year. That caused an influx of tradesmen and labourers not only from the nearby villages, but also from distant Polish locations and from The Russian Empire. In the night of 22/23 January 1863, the railway station was captured by a group of railwaymen from the works and Władysław Cichorski Zameczek's insurgent detachment. The repair works exist today as 'ZNTK Łapy S.A.' They played a decisive role in Łapy's urbanization, the town charter granted on 1 January 1925. At the eve of World War II, the town population reached 8000 citizens. During the war operations, the town was 80% destroyed, and the entire local Jewish population was murdered. Józef Kosacki, the inventor of the first mine detector was born in Łapy. His device was a significant contribution to the Allies' victory in WW II. Waldemar Kikolski a paralympic athlete was born in Łapy. He competed mainly in category T11 distance running events. Łapy hosts a railway station for all kinds of trains, which is situated in the town centre; and a railway stop Łapy Osse for slow trains only, in the Osse quarter, 3 km (2 miles) from the centre. Łapy's railway destinations are numerous: Bielsko-Biała, Warszawa, Suwałki, Białystok, Wrocław, Opole, Częstochowa, Kraków, Szczecin, Poznań. There are many small PKS bus stops and the main one – Łapy, next to the railway station building in the centre, from which local lines operate in the directions of Białystok, Zambrów, Siemiatycze, Bielsk Podlaski, etc. and Railway Fleet Repair Works. Unfortunately for the town, both of the works have been closed. There are plans to create a subzone of Tarnobrzeg Special Economic Zone. A corresponding bill has been submitted at The Cabinet. The development of industrial economy in Łapy and its neighbourhood is hindered first of all by the close proximity of Narew National Park. On the other hand, the town has a potential for the tourism industry. Block group in Sikorskiego St. and Spółdzielcza St.
A. Dobroński, Infrastruktura społeczna i ekonomiczna guberni łomżyńskiej i obwodu białostockiego (1866–1914), Rozprawy Uniwersytetu Warszawskiego, 197, Białystok 1979. J. Szumski, Łapy w latach 1862-1914, Białostocczyzna”, nr 1, 1997. ^ Ludność. Stan i struktura w przekroju terytorialnym (Stan w dniu 31 XII 2010 r.) (in Polish). Warszawa: Główny Urząd Statystyczny. 10 June 2011. ISSN 1734-6118. Archived from the original on 27 November 2011. ^ Powierzchnia i ludność w przekroju terytorialnym w 2010 r. (in Polish). Warszawa: Główny Urząd Statystyczny. 20 August 2010. ISSN 1505-5507. Archived from the original on 20 December 2013. ^ "Łapy Town and Gmina Website" (in Polish).